Gianfranco Ferre, the Italian designer known as the "architect of fashion" for his structured, sculpted shapes and for his groundbreaking tenure at Christian Dior, has died, a hospital said. He was 62. Ferre was taken to the San Raffaele hospital in Milan on Friday after suffering a massive brain hemorrhage. 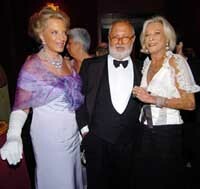 The hospital, in a statement authorized by Ferre's family, said he died at 9 p.m. (1900 GMT) Sunday. Condolences from Italy's top designers poured in as word of his death spread - just days before the menswear spring-summer 2008 collections were to get under way in Milan later this week. Giorgio Armani, perhaps the king of the "Made in Italy" world to which Ferre also belonged, said he had long admired Ferre's artistic and intellectual work. "When I think of Gianfranco Ferre, the idea that comes immediately to mind is the dignity, the calm, the sense of responsibility that he brought to his work," Armani said, according to the ANSA news agency. Ferre started his career as an accessories and jewelry designer, and then moved on to clothes. His unofficial title as Italy's architect of fashion came thanks to the degree in architecture he obtained in 1969 from Milan's Polytechnic Institute that inspired his designs. He started his own company in the mid-1970s, but his major leap came in 1989, when he was tapped by Bernard Arnault to be the top designer for Christian Dior. At the time, it was almost unheard of for a non-French designer to take the reins of the venerable Parisian house. Ferre stayed on at Dior until the fall of 1996, when he returned to Milan to tend to his own men's and women's collections. Ferre's style was based on simple and structured lines, and the white blouse became one of his trademarks. His suits were used by businesswomen around the world looking for a sophisticated look. For the evening, Ferre often made important dresses with ample skirts supported by layers of crinoline. Ferre himself cut a unique figure, a big teddy bear of a man dressed impeccably in three-piece suits. Donatella Versace called Ferre a man "from another time" who helped change Italian fashion. "He was a great couturier who knew how to create an absolute chic with details that I will never get tired of looking at and that will remain in the history of fashion," ANSA quoted Versace as saying. Roberto Cavalli said Ferre represented "the highest level of style, of artisanship, of creativity." "A true artist, pure, a beautiful person who will be missed by the whole fashion world," he said. In 2002, Ferre sold Gianfranco Ferre to It Holding, but he stayed on as creative director. His spring-summer 2008 menswear collection is scheduled to be presented Sunday in Milan. Born Aug. 15, 1944 in Legnano, in northern Italy, Ferre worked and lived in India for several years. His passion for travel and world cultures was often reflected in his collections. He is survived by a brother and sister-in-law, as well as a cousin, Rita Airaghi, who served as his longtime assistant.